Physiologically, left ventricular hypertrophy is primarily an adaptive remodeling process, compensating for an increase in workload placed on the heart with the aim of minimizing ventricular wall stress. Two contrasting models of adaptation may develop depending on the patterns of stress imposed. Pressure overload, caused, for example, by hypertension or aortic stenosis, requires the generation of greater intracavitary pressure during ventricular contraction. This is achieved by arraying contractile protein units in parallel. Relatively, an increase in wall thickness and a fall in cavity volume take place. Concentric hypertrophy, as this process is known, leads to decreased diastolic compliance and may place the myocardium at risk of ischemia, even without coronary artery disease. In conditions of volume overload, such as anemia or aortic incompetence, lengthening of contractile units leads to a physiologically useful increase in systolic stroke volume, according to Starling's Law. Unopposed, this process of left ventricular dilation leads to increased wall tension, a state known to increase oxygen requirements, and myocyte burnout. According to the Law of Laplace, the wall tension of a hollow spherical body is directly proportional to radius and pressure and inversely proportional to wall thickness. Thus, in states of left ventricular dilation, wall thickening and left ventricular hypertrophy are useful secondary order adaptations that tend to decrease wall tension. The molecular mechanisms that underlie these processes are slowly being unraveled. Subtle signaling changes can lead from physiologic adaptation to pathologic maladaptation. With continuing pressure and volume overload, cardiac myocyte apoptosis accelerates. In addition, fibrosis accelerates. Hypertrophy, apoptosis, and fibrosis are influenced by constitutional and genetic factors, hormones, growth factors, and cytokines such as endothelin 1, angiotensin II, insulin-like growth factor, and tumor necrosis factor α. The balance of these factors and downstream intracellular signals can alter the balance among hypertrophy, apoptosis, and fibrosis (1). Experimental studies, especially the pioneering work from the Heidelberg group, have greatly advanced our understanding of the morphology and pathogenesis of uremic cardiomyopathy. The principal morphologic features are increased heart size, interstitial fibrosis, thickening of intramyocardial arterioles, and a reduction of capillary length density, so that there is a reduction in the ratio of perfusing capillaries to myocardium supplied (2). In these models, uremic cardiomyopathy is very much a “metabolic” condition, with little or no relationship to classic hemodynamic stresses, such as hypertension and anemia. Parathyroid hormone (3) is a permissive factor for these changes, which seem to be preventable by angiotensin-converting enzyme (ACE) inhibition (4), agents that reduce central sympathetic outflow (4) and endothelin antagonists (5). Hyperparathyroidism, by virtue of its effect as a calcium ionophore, is known to lead to intramyoctye calcium overload, altered bioenergetics, and relative ischemia (6). Bradykinin may also be a contributory factor to the preventive action of ACE inhibition (7). Immunohistochemical studies of signal transduction factors suggest that rates of apoptosis may accelerate during the development of uremic cardiomyopathy (8). Left ventricular hypertrophy is a histologic entity. Myocardial biopsy is rarely performed, so it is rarely possible in practice to prove that maladaptive pathologic features, especially fibrosis, are present. Instead, we rely on measures of left ventricular size, geometry, and function. Echocardiography is noninvasive and provides an accurate assessment of each of these parameters. For each parameter, superior techniques exist but are not routinely used because of expense, unavailability, or invasiveness. Thus, magnetic resonance imaging seems to be a superior technique to assess left ventricular mass and cavity volume in patients with end-stage renal disease (ESRD) (9). Similarly, cardiac function is measured better with invasive techniques. In practice, echocardiography is a reasonable overall tool and is highly suited to longitudinal research studies. Left ventricular mass is calculated by assuming that the ventricle is a hollow spheroid. In the general population, left ventricular mass increases with age, male gender, and body size. For comparative purposes, left ventricular mass usually is normalized to some index of body size. The ideal method remains a matter of debate. However, normalization to body surface area is the most commonly used method. In the healthy, adult, Framingham population, the upper limits of normal are 131 g/m2 for males and 100 g/m2 for females (10). Calculated mass index increases with extracellular fluid volume expansion. The calculated mass index has been estimated to decrease by approximately 26 g/m2 during a dialysis session, as a result of fluid removal (11). A consequence of this is the need to interpret echocardiographic mass index in light of extracellular fluid volume in dialysis patients. Many recently completed and ongoing studies have specified arbitrarily the need to study the patients within 1 kg of dry weight, typically immediately after dialysis or the following day (12). A classification that is in common use categorizes patients on the basis of relative wall thickness and the presence of left ventricular hypertrophy. Relative wall thickness is calculated as (IVS + PWT)/(IVS + PWT + EDD), where IVS is the thickness of the interventricular septum, PWT is posterior wall thickness, and EDD is the end-diastolic diameter of the left ventricle. Normal relative wall thickness is defined as being <0.45. Patients are divided into four categories as shown in Figure 1A. This classification system has been shown to have long-term prognostic power in patients with essential hypertension (13), a situation in which concentric left ventricular hypertrophy is a much more common adaptation than left ventricular dilation. Where left ventricular dilation is present, the absence of hypertrophy is a catastrophic situation, as it implies a very thin-walled ventricle working under high tension. These patients are classified as normal using this system, because relative wall thickness is <0.45 and the left ventricular mass index is normal. In dialysis patients, a classification system that depends much more on left ventricular cavity volume has been shown to have superior discriminant power for predicting new-onset ischemic heart disease, cardiac failure, and death. In this system, shown in Figure 1B, prognosis worsens, as shown in Figure 2, as follows: normal (cavity volume < 90 ml/m2, no LVH), concentric LVH (cavity volume < 90 ml/m2, LVH), LV dilation (cavity volume > 90 ml/m2), and systolic dysfunction (fractional shortening < 25%) (14). (A) Classification system of Koren et al. (13), which has prognostic impact in essential hypertension. Relative wall thickness (RWT) is calculated as (IVS + PWT)/(IVS + PWT + EDD), where IVS is the thickness of the interventricular septum, PWT is posterior wall thickness, and EDD is the end-diastolic diameter of the left ventricle. (B) Classification system, which has prognostic impact in dialysis patients (14). 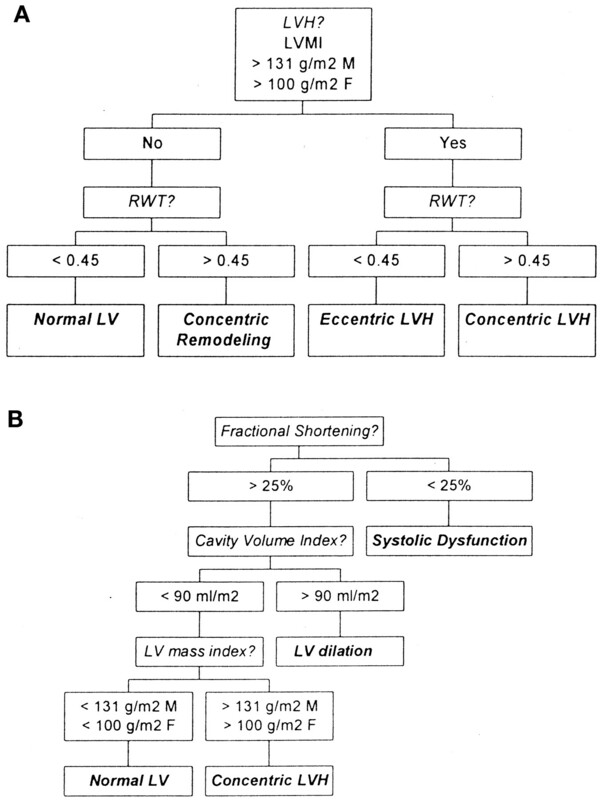 (A) Spectrum of left ventricular abnormalities at inception of dialysis therapy (14, 16, 20). (B) Outcome, adjusted for age, gender, and diabetes mellitus, according to type of left ventricular abnormalities at inception of dialysis therapy (15, 17, 21). N, normal; CLVH, concentric left ventricular hypertrophy; LVD, left ventricular dilatation; SDF, systolic dysfunction; IHD, ischemic heart disease; CHF, congestive heart failure. Left ventricular hypertrophy has a prevalence of approximately 40% in patients with chronic renal insufficiency, a figure that rises to approximately 75% by the onset of ESRD (15,16). Cardiovascular mortality rates in ESRD patients are high and have been estimated to be between 100 and 1000 times more than expected in young adults. Cardiac failure and LVH are key prognostic variables. It became clear in the past decade that accelerated pump failure may be a greater problem than accelerated atherosclerosis, which remains a disputed entity in these populations. (17). Progressive left ventricular dilation, which becomes less reversible with time, seems to be the most characteristic morphologic pattern of dialysis patients (18, 19). As shown in Figure 2, cardiac enlargement and poor systolic function were associated with increased risks of developing ischemic heart disease and cardiac failure in dialysis patients, in one long-term cohort of dialysis patients starting dialysis therapy (20). In addition, a fall in left ventricular mass index or a rise in fractional shortening in the first year of dialysis therapy was associated with a lower probability of new-onset cardiac failure (21). Many risk factors for left ventricular hypertrophy have been suggested in chronic renal failure patients, some of which are shown in Table 1. Risk factors that inherently are less easy to reverse are shown in the left-hand column, and those that are more susceptible to intervention are listed in the right-hand column. Arteriovenous connections are amenable to intervention, an option that is rarely exercised because they represent a life line for hemodialysis patients. Anemia has been associated with left ventricular hypertrophy in most echocardiographic studies of renal patients. Most of the initial studies were performed in dialysis patients. One of the earliest studies to demonstrate this was that of London et al. (18). Echocardiography was performed in 57 selected normotensive hemodialysis patients in comparison with 40 healthy control subjects who were matched for gender, age, and BP. Enlargement of the ventricle was related to the degree of anemia and the hemodynamic effect of the arteriovenous fistula. The study of Levin et al. (15) showed a robust association between modest declines in hemoglobin levels, from a baseline level of 12.8 g/dl, and progressive left ventricular growth in patients with early renal insufficiency. Our own prospective inception cohort study of dialysis patients showed clear, inverse relationships between baseline hemoglobin levels and cardiac size. In this study, monthly hemoglobin levels were lower than conventional guidelines suggest, at an average of 8.8 g/dl. Anemia in the long term was associated with progressive LV dilation, new-onset cardiac failure, and death in these patients (22). These findings are consistent with several observational studies that have suggested a dose-response association between the severity of anemia, mortality, and hospitalization in hemodialysis patients (23,24,25,26). Several treatment studies demonstrated that partial correction of anemia leads to a decrease in left ventricular dimensions, without leading to full correction of left ventricular hypertrophy and dilation. In addition, partial correction of anemia has led consistently to improved quality of life, exercise capacity, and cognitive function (27,28,29,30,31,32,33,34). The impact of complete correction of renal anemia is a reasonable question in light of these findings. Several studies have examined this issue, and more are in progress. The United States Normalization of Hematocrit Trial studied 1233 hemodialysis patients with symptomatic ischemic heart disease or cardiac failure. The primary outcome was either myocardial infarction or death. By general population norms, these patients had been anemic for several years. Patients in the higher hematocrit group (42%) had a trend toward greater mortality than those in the lower hematocrit group (30%) and a higher rate of vascular access thrombosis (35). This study showed that late normalization of hemoglobin was not beneficial in chronically anemic hemodialysis patients who had already developed decompensated cardiac disease. The Canadian Normalization of Hemoglobin study also compared normalization of hemoglobin to partial correction of anemia in hemodialysis patients. A total of 146 hemodialysis patients with either asymptomatic concentric left ventricular hypertrophy or left ventricular dilation were randomly assigned to maintain hemoglobin levels of 10 g/dl or to be ramped upward, to 13.5 g/dl. In the left ventricular dilation group, the changes in cavity volume were equivalent in both hemoglobin groups. 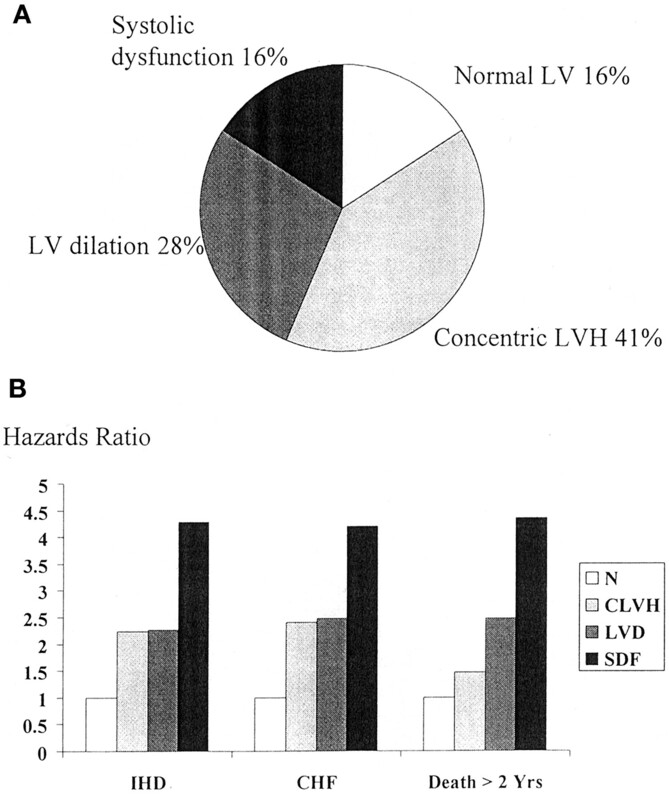 In the concentric LV hypertrophy group, the changes in left ventricular mass index were similar; those assigned to higher targets, however, were less likely to have developed left ventricular dilation. Patients in the higher hemoglobin arm had less depression and fatigue and improved relationships. There was no increase in the rate of dialysis access loss (12). It is likely that the left ventricular changes observed in uremic patients may be more inherently susceptible to prevention than to treatment. The evidence against target hemoglobin levels below 11 to 12 g/dl is persuasive. Normalization of hemoglobin is very likely to be associated with enhanced quality of life and physical performance, but the safety and cost of this approach and its impact on cardiovascular outcomes remain open questions, as do the relative effects of early and late intervention. Ongoing randomized trials should shed light on this issue over the next 5 yr. Hypertension, which is ubiquitous in renal impairment and may be caused partly by extracellular fluid expansion, activation of neurohormones, endothelial dysfunction, and large artery stiffening, has shown inconsistent associations with mortality in dialysis patients. Most recent observational studies have tended to show an inverse, or absent, association with mortality. There is a considerable possibility that these effects are an example of reverse causation in an inherently diseased population, in which the relationship “risk factor leading to disease” has evolved into “disease state modifying former risk factor.” In contrast to the inconsistent mortality associations, the observational literature consistently associates left ventricular hypertrophy with rising BP, in both cross-sectional and prospective designs and in both early renal disease and ESRD. Thus, in the study of early renal insufficiency patients of Levin et al. (15), increasing systolic BP levels, even within ranges close to conventional normotension, were independently associated with progressive left ventricular hypertrophy over a 1-yr period. Our own prospective study of dialysis patients (36) found a positive association between time-averaged BP levels and the likelihood of progression of left ventricular hypertrophy, new-onset ischemic heart disease, and new-onset cardiac failure. These associations were also apparent within apparently normotensive ranges. A recent cross-sectional study of hemodialysis patients suggests that ambulatory BP levels correlate even more closely with the extent of left ventricular hypertrophy (37). Studying the ideal approach to BP control in patients with renal insufficiency largely has been neglected. Interdialytic fluid gains were associated with echocardiographic left ventricular hypertrophy in the classic study of London et al. in 1987 (18). Attaining true dry weight seems desirable, as suggested by case series that suggest that intensive ultrafiltration regimens can lead to regression of left ventricular hypertrophy and systolic dysfunction in dialysis patients (38). Observational studies suggest that daily hemodialysis regimens may be superior to intermittent regimens in this regard (39, 40). In practice, most patients with ESRD still receive antihypertensive medications. Very few studies have compared the efficacy of different classes of agents in regressing left ventricular hypertrophy. Some observational studies suggest that ACE inhibitors may lead to regression of left ventricular hypertrophy by mechanisms that extend beyond BP control (41). London et al. (42) randomly assigned a group of persistently hypertensive hemodialysis patients to perindopril or nitrendipine in a 1-yr study. Although similar reductions in BP levels were achieved, the ACE inhibitor group had superior regression of left ventricular hypertrophy (43). It remains to be determined whether polymorphisms of the ACE gene influence this process in patients with renal insufficiency. Animal and human studies suggest that only a minor component of uremic cardiomyopathy is attributable to known factors. This suggests, indirectly, that the uremic internal environment has a direct effect on cardiac size, shape, and function. The experimental models alluded to in the second section of this article strongly support this hypothesis. The best clinical evidence published to date is indirect—the observation that left ventricular hypertrophy, left ventricular dilation, and especially systolic dysfunction improve after renal transplantation (44)—and in sharp contrast to the progressive worsening seen in patients who remain on dialysis therapy. Abnormalities of calcium-phosphate homeostasis may be associated with left ventricular abnormalities in patients with renal insufficiency. Relatively few clinical studies have addressed these issues with scientific rigour, and the impact of these parameters on bone function is much more clearly delineated. Hyperparathyroidism has been associated with inadequate compensatory wall thickening in states of left ventricular dilation (18), and left ventricular parameters have been observed to improve after parathyroidectomy (45). Myocardial calcium deposition seems to be common in ESRD (46). Its reversibility and prognostic impact are unknown. It is noteworthy, however, that a high calcium × phosphate product is associated with increased mortality in hemodialysis patients (47). These clinical findings, which are disparate, coupled with convincing elegant and extensive experimental findings in animals, support the hypotheses that aggressively lowering the duration and extent of exposure to uremic toxins, hyperphosphatemia, and hyperparathyroidism promotes cardiac health in renal insufficiency. The precise contributions of traditional and uremia-specific factors to the development and progression of left ventricular dysfunction in renal patients remains to be elucidated. We have known since 1836 that ventricular abnormalities are highly prevalent in ESRD (48). Our understanding of the importance and pathogenesis of these processes has accelerated in the past decade. The growth of basic scientific, observational, and interventional research is explosive and is likely to lead to therapeutic advances in the next decade.